Due to its growing popularity in our society, it is increasingly common for many commercial brands to choose the Camino de Santiago as an objective to promote themselves and achieve relevance, but not all of them bet on accompanying their message of solidarity. Aristo Pharma and its 200 employees have decided to make a pilgrimage to Obradoiro Square, but with a check of 10,000 euros under the arm, with the aim of contributing three quarters of the funds needed to build a clinical laboratory in a hospital In Haiti. Since last May, company employees have traveled up to 950 kilometers from the Camino to Santiago de Compostela with three main objectives. The first, visit up to 250 pharmacists to publicize a cream they currently produce, especially recommended to relieve the pain of pilgrims; The second, that employees coexist with each other to get to know each other better, and the third, to donate 10,000 euros to the NGO Pharmacists Without Borders, so that they can continue working on their nutrition program in impoverished Haiti. Different employees to the company, based in Torrejón de Ardoz (Madrid), have traveled the Camino for stretches of 20 kilometers, relieving during the last months and visiting large number of pharmacies. 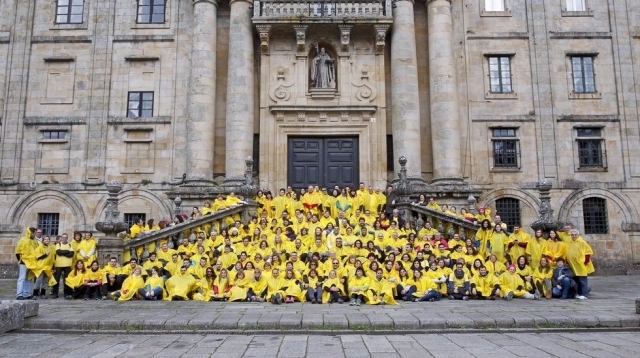 The last challenge has been to make the 200 employees together the final 5 kilometers to the Obradoiro square, where they have been photographed as a large yellow mass (thanks to their raincoats), later to deliver the solidarity check to Angel Acisclo Huélamo, technical director Of Pharmacists Without Borders Spain, at Hospedería San Martín Pinario.